My wife and I received a large indoor plant as a gift and were warned that it would grow to be over two metres tall. My wife wanted it in our dining room but wanted the pot hidden, so I was tasked with making a suitable planter. Our dining room is furnished in English country-style and the planter was to be in keeping with that. It also had to be large enough for the present pot and stable enough for the potential future size of the plant, without looking too agricultural. 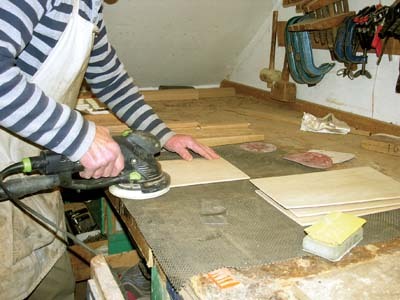 The panels would be made from oak-faced ply so that they could be glued in all around for added strength. 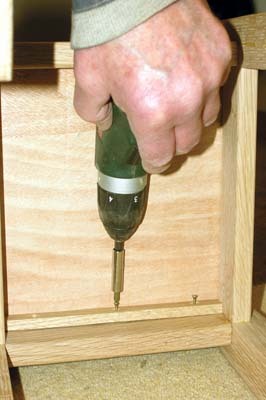 The base would be a 'drop-in' loose fit so that it could be removed and replaced easily in case of water damage. 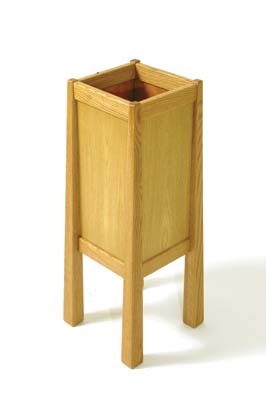 A satin polyurethane finish would protect the wood from any water splashes or dampness associated with the plant. The dining room is furnished entirely in English oak, so that was the obvious choice of timber for the planter, and I happened to have a piece of 50mm thick stock in my wood store that, with careful cutting out, would just be enough for the job. It was originally kiln-dried and had been in my store ever since, so it was ready for immediate use. The stock was surfaced and thicknessed and two blanks, each for a pair of legs, were cut out. Strips for the rails and base supports were cut next. 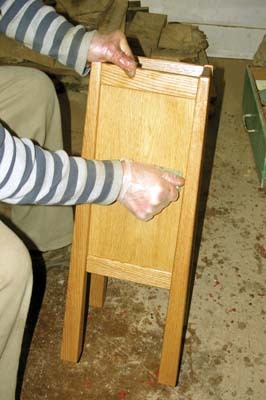 The pieces were sticked and stacked in the workshop to allow even drying of the exposed surfaces, and to condition the wood during the making. 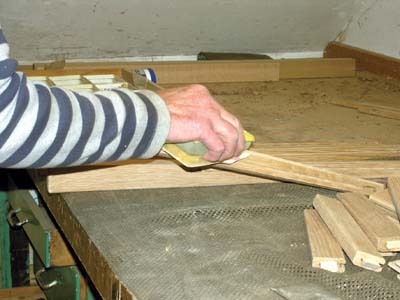 The blanks for the legs had been thicknessed to the correct dimension and were now cut to length. 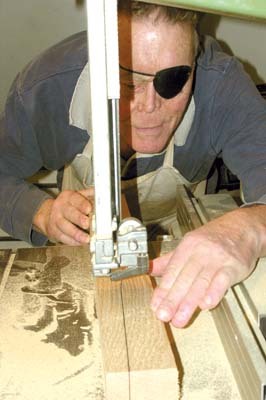 The width of the oblong blank was the sum of the width of the top of the leg, plus the width of the bottom of the leg, plus 4mm for a saw cut down the diagonal and cleaning up with a plane. 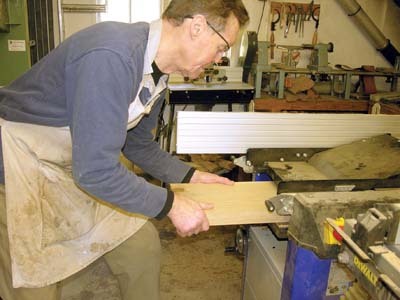 The diagonal was marked on the blank and the first cut made on the bandsaw - this gave the taper to one side of the leg. 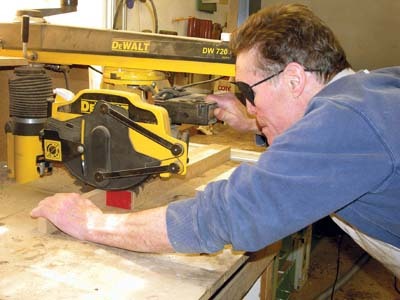 An adjoining face was marked and the taper cut again on the bandsaw to give the second tapered face at right angles to the first. All the faces of the legs were planed to correct size and sanded down to 150 grit. 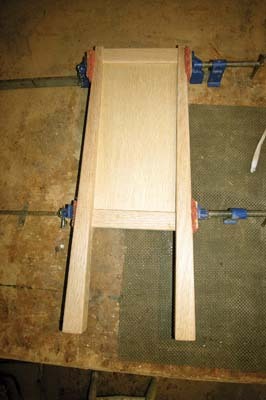 The outside long edges and all four top and bottom edges of the legs were rounded over with a bearing-guided 3mm radius cutter on the router table. 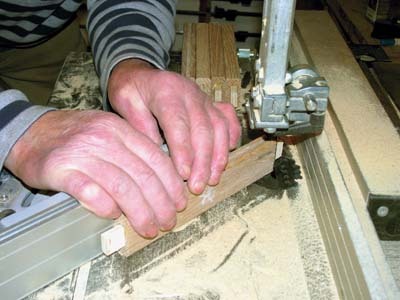 Domino slots were cut for the rail joints and stopped housings for the panels. 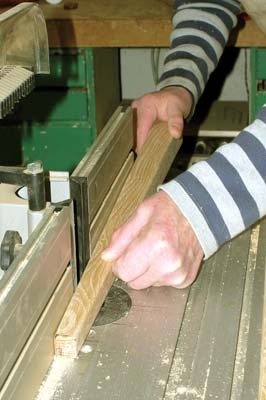 The rails were faced and thicknessed to the correct size then cut to length, and the long edges rounded over with the same 3mm radius cutter. 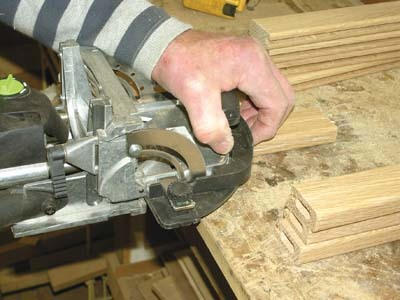 Housings were cut for the panels, and Domino slots cut in the ends. the leg and would not allow the joint to close properly. The solution was to either shorten the Dominos or mitre the ends - I choose the latter as it made for a stronger joint. 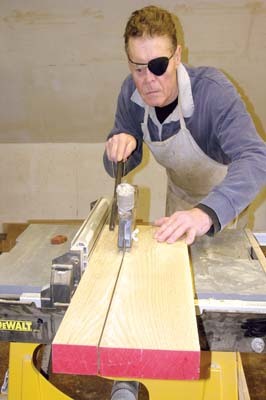 The Dominos were glued into the rails and mitred on the bandsaw. The panels were cut to size from a suitable piece of oak-faced ply and sanded ready, for fitting into the housings in the legs and rails. All the individual components were power- and hand-sanded down to 240 grit, and one set of joints and a panel test fitted dry. 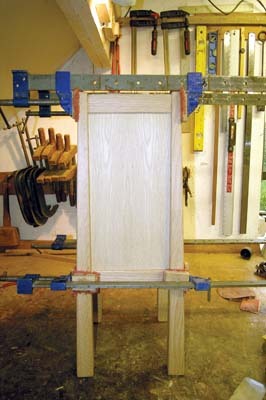 When I was happy, glue was applied to the Domino slots in the legs, and the panel housings and the front and back were assembled. 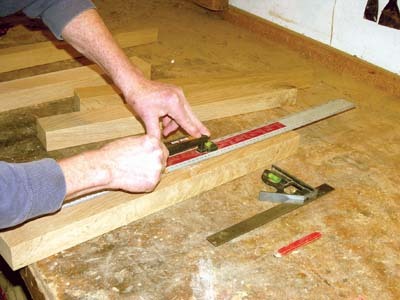 I then clamped up the panels, checking the diagonals for square by measuring across the diagonals. Adjustments were made as necessary and they were left to set. When they were ready, the front and back were attached by fitting the side rails and panels in a similar way and clamping up. All the diagonals were checked and adjusted, and the whole piece stood on a level surface and left to cure. 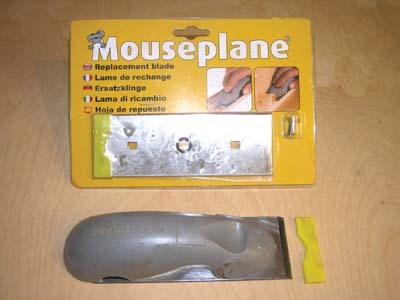 The glue ooze was removed using, as well as my usual scraper and abrasive paper, my new mouse plane, as reviewed in this magazine. I find this a very useful little tool, ideal for removing glue ooze, particularly inside drawers. Its prime function is to flatten hot plastic filler, but I have found a myriad of uses around the workshop where it is awkward to get a cutting edge flat and up to a face. As with any other edge tool, the sharper the blade the more effective it is, and I keep mine well honed. Well worth the small cost of around Â£10. 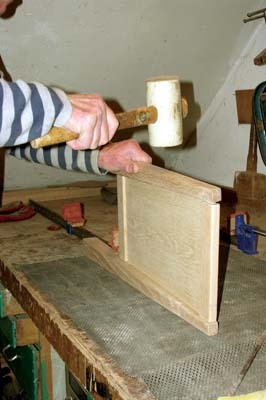 I then glued and clamped the two remaining side panels in place with their bearers, being careful to use blocks so that I did not mar the surface of the oak. 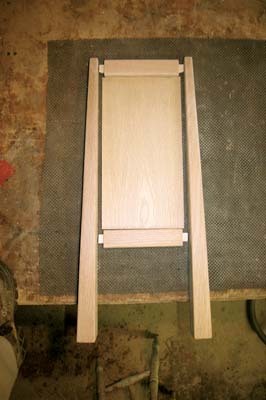 Bearer strips for the drop-in base were screwed to the bottom rails, and a ply base cut and fitted. Most of the individual components had been power sanded down to 240 grit prior to assembly. The whole piece was now checked over, any blemishes and clamping marks removed, and finally hand sanded ready for the PU varnish. During plant watering this piece was vulnerable to water splashes, so I chose a PU floor varnish by Liberon, as it has a high-resistance to water and is less likely to mark. 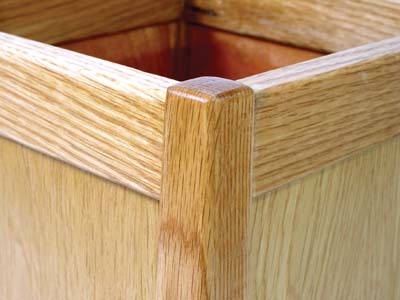 A satin finish most closely matched the oiled finish on the oak furniture in the room. The first coat was diluted with 20% white spirit and applied with a sponge. I prefer to apply finishes with a 'one use' sponge or pad - there are no brush marks or stray hairs, and no brushes to clean! 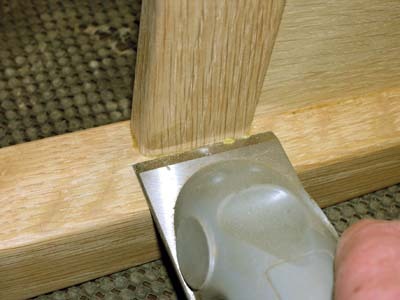 Once it was dry, a light sanding removed any blemishes missed before that had been highlighted by the first coat. Two more coats of undiluted varnish were applied at 8-hour intervals, with a light sanding to de-nib between coats, again with a sponge. The piece was left in the workshop for a full week to harden fully. I had made the planter larger than the existing pot to allow for future re-potting, so I put a wooden block on the base to stand it on in the meantime. Once the plant and planter were in position I "That's nice, dear" and a cup of tea. Who could ask for more?